The bracket may be fugly, but the Sony sits tight and hidden, a good thing because you just dont display good sound systems openly here. We do have a lot of criminals in our country. After connecting all the wires, and then looking if the car blows up or not, it was time to test the sound. 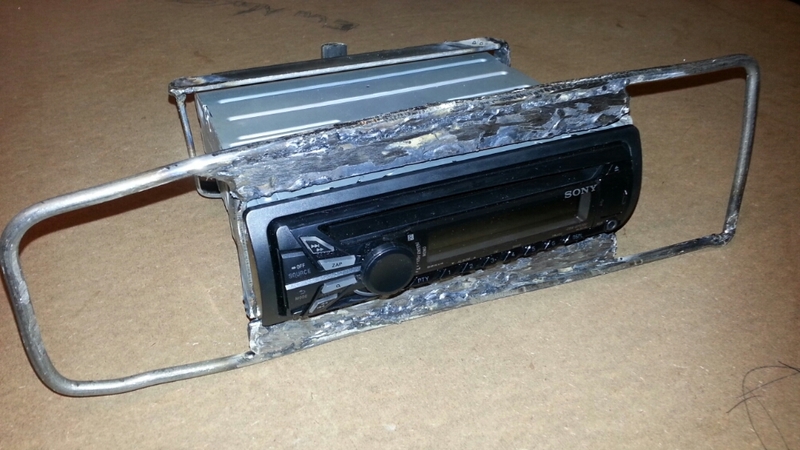 I am still waiting for the door inner panels, which also has a Pioneer speaker in each. But in the rear behind the back seat I have two Alpine 6×9″ speakers. So today I deviated from my usual Dire Straits Brothers in Arms CD to test the sound. No, I inserted my newest CD. Riana Nel is a Namibian musician, she is beautiful and has the voice of an angel. She is the sister of equally gifted Nianel. Riana sometimes sings in my mother tongue- Afrikaans. And this CD of hers is good. Beautiful words and beautiful music. One of the very best artists in Southern Africa in my view! And what an experience we had tonight. 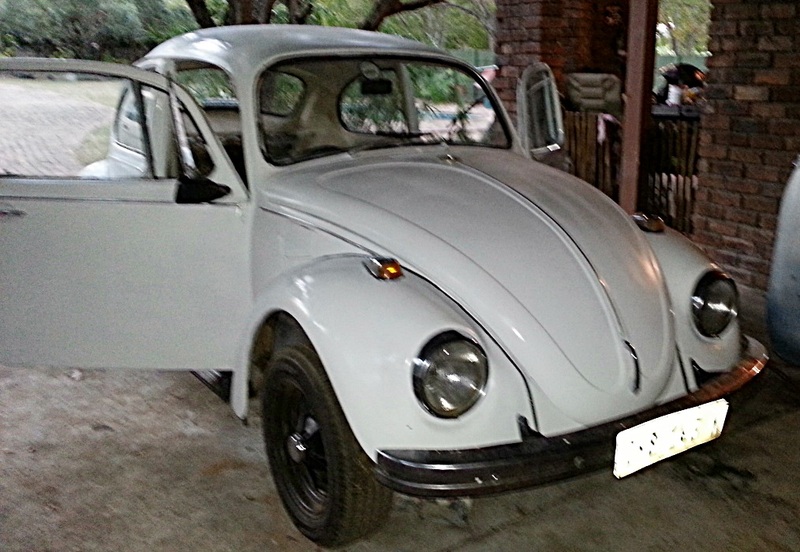 The Beetle really has great accoustics, it felt as if we were sitting in the front seats of a Riana Nel concert… and Riana really gives excellent performances! So what a way to initiate the sound system. Riana Nel rocks! And now I have seen on Twitter that she has a new CD out, will definitely buy one at the airport on Thursday! Man, I just wish I could build better brackets! This week is extremely busy and hectic. The financial guys in church decided we must raise more funds with another mini fete next Saturday. So I am back to being a butcher- we have 3 large Bovines and 8 Porkers to get from the hoof into consumable sellable portions.. And it is my responsibility to get it done with a team. We are 2/3 rds through’ but it is really hard work. Meanwhile, back at the Parsonage my eldest son passed his Driving License Test with flying colours on Monday. 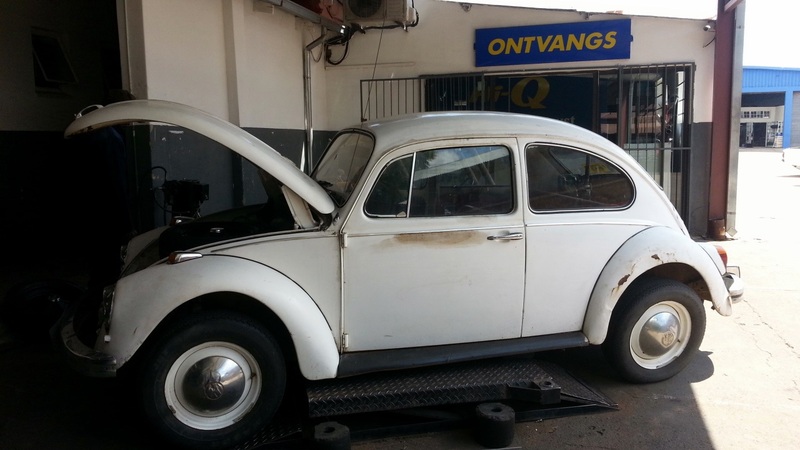 But the Beetle is not ready yet! I am still waiting for the upholsterer to finish the inner door panels. Last night I began with the most important part of the project. According to 18 year olds. I would have said the engine, mothers would have guessed the brakes. But of course teenagers would start at the Sound system! Yesterday evening I jumped into the Beetle with an angle grinder and a file. 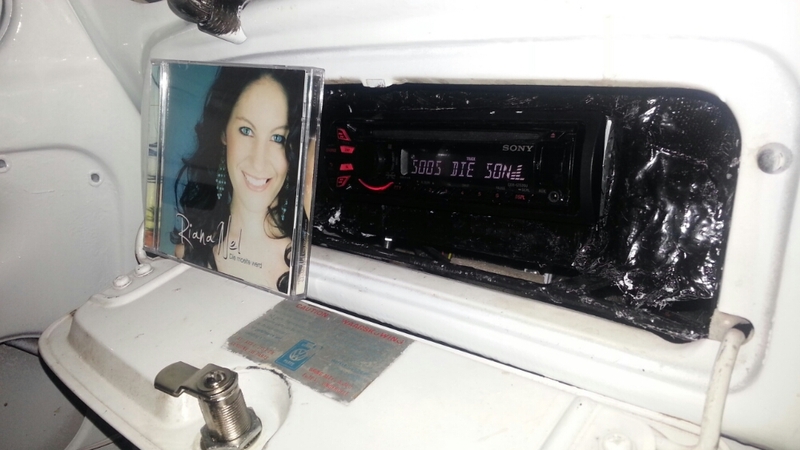 The hole for the stereo is much too small for the modern players. So I enlarged it. And the Beetle experts guessed it right. Smack Bang into the wiper motor. So now the stereo has to go into the glove box. I am not an artist. I do not have the ability to take up a brush, and paint a beautiful painting. I do not have the ability to weave words into a beautiful poem. 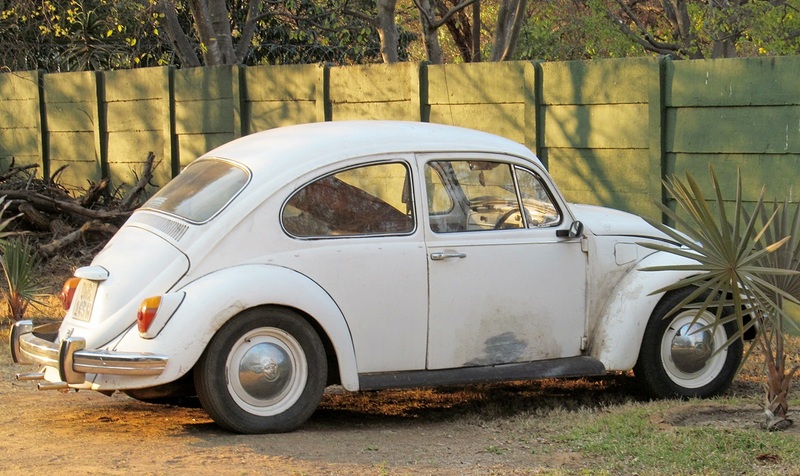 But the past few months I tried to bring some beauty out of death… My old VW Beetle was dying a slow death- Rusting in Peace. It did not move anymore. Yes, it is not art… yet… but it is slowly getting there- the 4th generation of our family behind this car’s steering wheel, that is art in my eyes! So maybe this could be art? I am very scarce on my blog at the moment. Sorry about that! I am working quite hard at the moment in our church, we had the funeral today of the well respected man who died last week. I am now building a fiberglass floor for the Beetle. 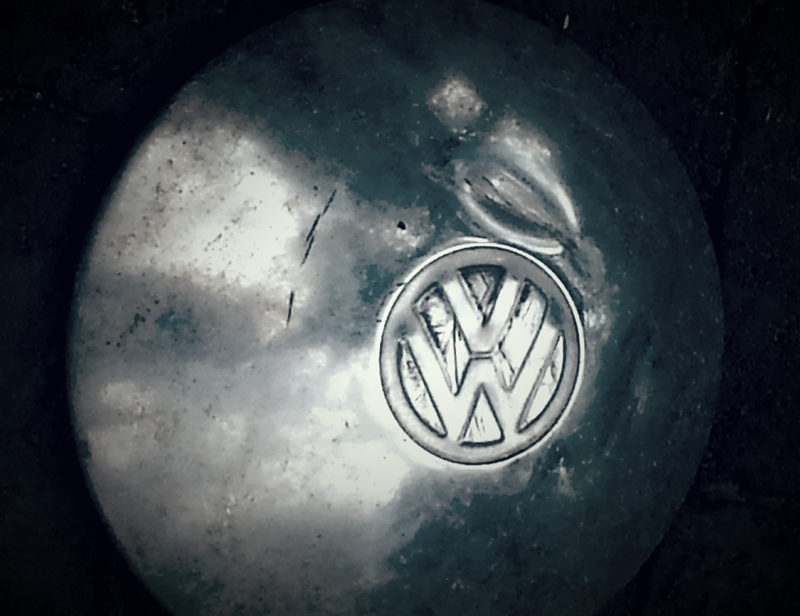 I know that some internet sites says that it is not a good thing, and that only original VW Floor Pans should be used. I am in no way able to afford that at the moment. So- I got some expanded metal from an engineering firm in our town. 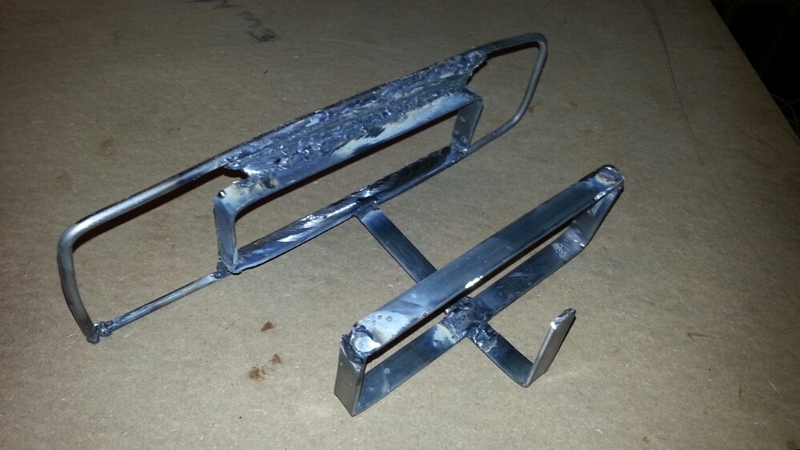 I cleaned it with hydrochloric acid, then rinsed it and bolted it to the floor pan. Every now and then I snuck off for an hour to work on this. Last night I put on the first Fiberglass layer on the floor, and just now the second layer. When it is completely dry, (cured?) I will put a layer of stone chip rubberizing on as a floor. I really hope it will not look too shabby! Here is just an update on the state of the floor today before the second layer. 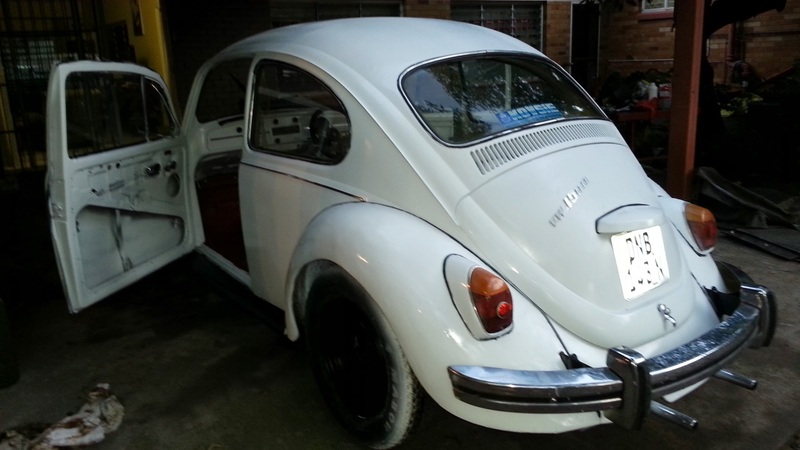 I must confess… last night I would have given the Beetle away for free. But sorry- you are too late, I feel a little bit better today! I stayed over at my mother’s house in Pretoria on Wednesday night. Yesterday morning I had to visit some of my critically ill church members in hospitals in Pretoria again. I also used the opportunity to buy my BMW a Givi Topbox, as I like to look like the pizza delivery guy! 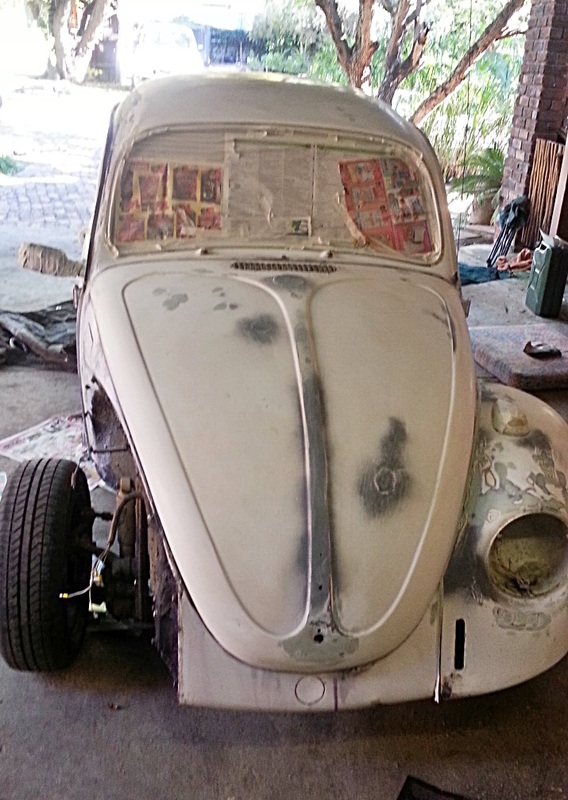 Last night when I came home, I felt the urge to work some more on the Beetle… I peeled away an old floor mat of the Beetle. And saw that the damage that the rust has left, is much worse than I thought. 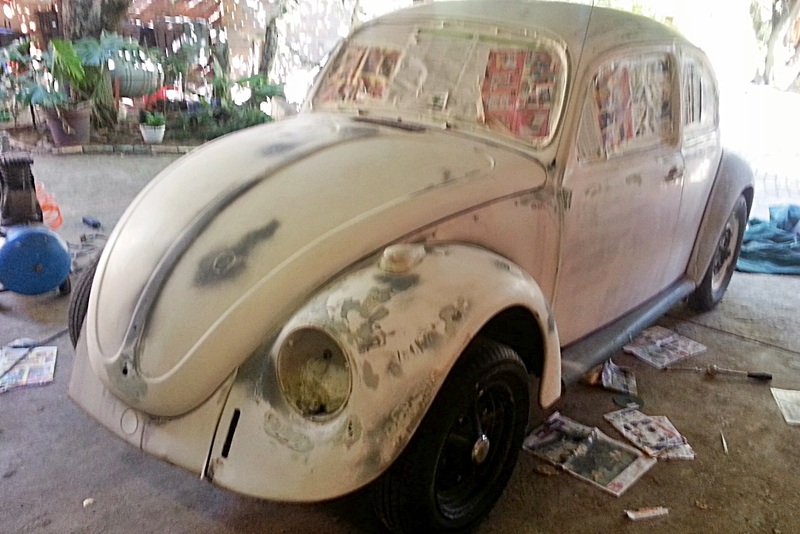 Like I said on facebook- The outside is done becaise the paint is finished! It now needs a very thorough cleaning, some sanding with 1500 grit paper and rubbing compound, and then a layer of good quality car polish. I still need to fix the floor pan with fibre glass, and I will also have to engineer a new bracket for the petrol pedal. So that is why I am so scarce on the blogs at the moment, and in town, and in my friends company… This was a LONG Day! This morning, with much fear and trepidation, I applied the first color coat of paint. It did not go as planned from the beginning. The first batch had too much thinners in it, and the paint did run exactly as I did not want it to. In any case- there might be another exciting prospect on the horizon. The Rider MIGHT just have a new stallion soon. Ok, not new, also a 2000 model. But I will post when it happens. 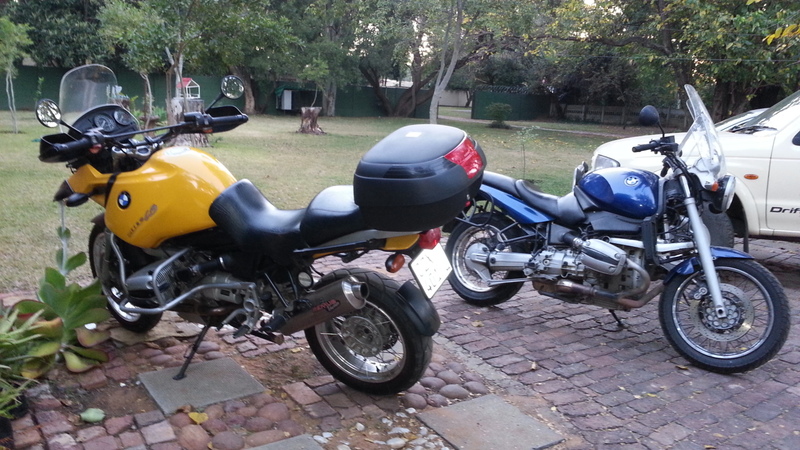 Meanwhile I am desperately searching for buyers for my BMW R 850 R. I do have an offer for my Aprilia, but I want to keep it for my sons… Watch this space… or buy this bike and come and tour South Africa! 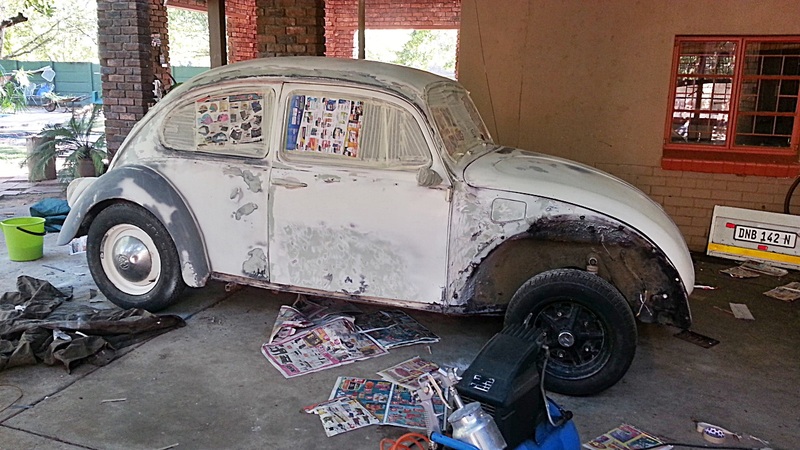 This morning, after a hearty breakfast with some fellow Word Riders, my son and I had another go at the Beetle restoration project. It is a public holiday in South Africa today. Yesterday was Freedom Day in South Africa, remembering the day in 1994 when all South Africans could vote for the first time. When a public holiday falls on a Sunday, it is the habit in our country that the Monday is then also a Public Holiday. We have finished the primer coat this morning. As I understand it, the primer must now cure for about 24 hours before applying the color coat. We also, with great tears and suffering, put back the fender that we had to take off. It is starting to look like a car again. 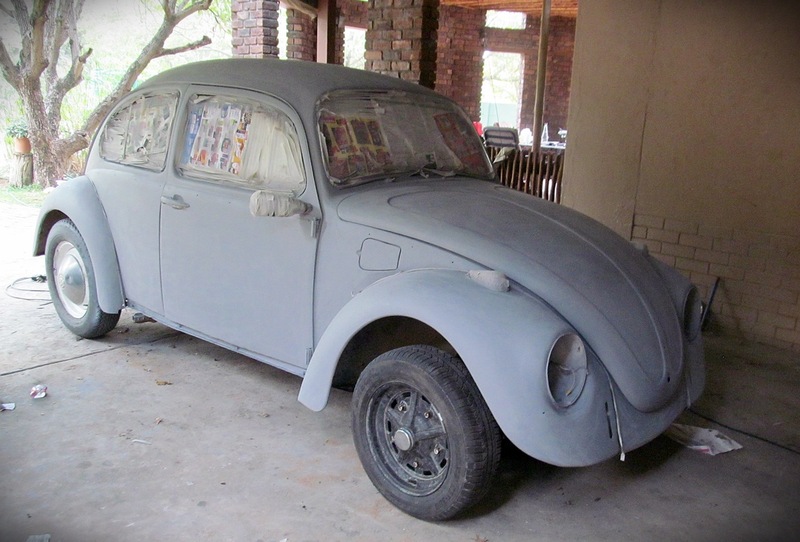 Although the many enemies of the Beetle/ Bug will doubt that it will ever look like a car! I am quite proud of this door! It was rusted through, as well as the panel where the fuel cap is situated. I fixed it will fibre glass 2 years ago (after another few sessions of Youtube!) That is also why the front fender had to come off- to sand the fibre glass layer decently and get it level and smooth. I must confess that the car looks good from a distance, but with closer scrutiny it will still show a lot of pock marks that I am not able to fix with my subnovice skills level. But you know what, it is coming along nicely. I have tackled a huge project that I have no clue about. And we are slowly winning the battle! It might be ugly, but I will be proud of it! I will keep you posted as we move along! It is difficult when you know nothing, and try to do a professional job! I now have great respect for all the good panelbeaters and car restorers in the world! How on earth do you get all the surfaces as smooth as a baby’s bottom? PS- I learned A HUGE lesson in life: You have to keep the spray gun’s nozzle clean, otherwise it will block… I can’t wait to share it with my wife! The past few days were quite hectic. 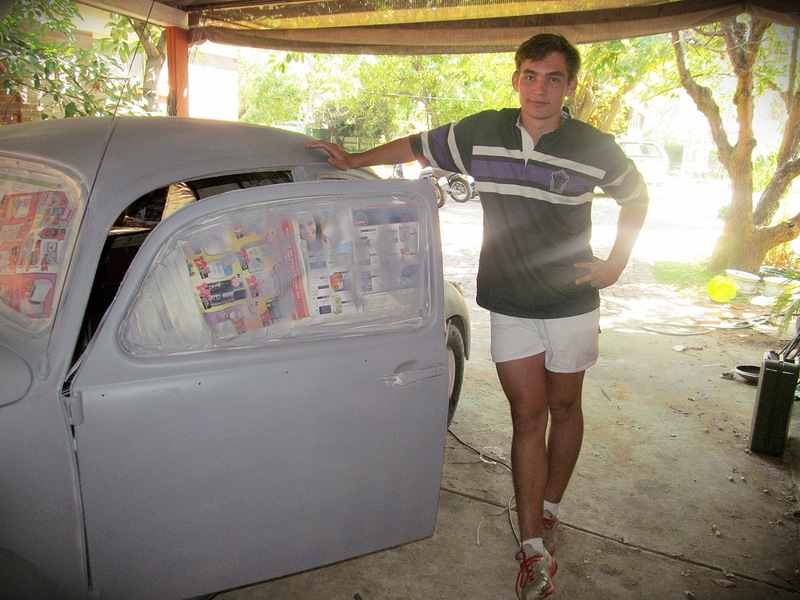 Every little bit of time that I could, I was busy putting on body filler to small holes, sanding, trying to get a good foundation for the paint job that follows… I worked late at night, and started again early in the mornings. Now… tomorrow I have to conduct a funeral service. A man I have great respect for died on Monday. I have to see his widow and son in an hour’s time to make the last arrangements for tomorrow morning. And then- the moment of truth arrives. I have to use a spray gun for the first time in my life… I really really hope I get it right! I don’t have the money to get professional help, and I really want to give my son this car as his 18 th birthday present. Looking as good as I can get it. I really thought this would go much quicker!